Those look to be either land masses or glitches on the image because they don't move one iota despite all the movement around them. I have tried to enlarge the image but all I get is large pixels, without definition enough to discern their true nature. They are very small. I wonder if there is someone with more detailed knowledge of the waters in that area, or maybe access to images with better resolution. Update: if you go to 24th September 2015 you will see something in the exact same spot that doesn't move in the days either side. There is more ice but the same spot is there. Finally found the answer. They are grounded calved icebergs from the nearby glacier. The Sentinel playground shows them clearly here. I found a reference to the Humboldt Glacier calving front being up to 50m high. That would give a considerable depth below water. As the icebergs are in lines I expect there are some old sills at that end of Kane basin. I found a sequence near the bell floe on Sentinel - at this link - that shows this very clearly. The GIF below starts at 16th June and skips cloudy days. The last image is the last available, from 29th June. Points to note: watch the triangular-shaped iceberg at top right. It moves a little, seems to get stuck, and then gets knocked out of position by some sea ice and appears at bottom left. You can also see another square-ish iceberg which moves out of the original line but ends up stuck despite the sea ice coming through. Also note the difference in the colouring. The sea ice is clearly covered in melt ponds, but the icebergs stay gray presumably because they are not flat. I've put in a nice shot at full resolution illustrating this from 27th June. Edit: corrected left/right; and note that the triangular iceberg is around 300m long. Thanks bairgon, great animation and explanation. Yes Bairgs, your theory has great merit. The underwater obstructions must wreak havoc with the ice and cause chaotic flow patterns. Looking at the calving front of Humboldt Glacier, shadows can be seen in the lee of the icebergs. Using the scale and a mm rule my best guess is that the shadows are around 40m. Using the excellent suncalc website for that date and changing the time to match the shadows shows that the height of the iceberg is around 25m. Assuming that the iceberg has a linear profile (i.e. it doesn't get fat underwater) then the draft of the iceberg would be around 175m. The bathymetry map attached shows a ridge about 100m deep running parallel to Humboldt, explaining why these icebergs get stuck. Judging by the latest Sentinel image the Bell Floe has broken up somewhat. The North end of the Nares strait is now crammed with mobile ice it'll be interesting to see how fast it moves through. From the pictures, it looks like nothing much is going through Fram. Is it melting at the top end, or is there just no pressure through the pipe? Temps have been spiking recently, reaching 10oc. I find it surprising that any fast ice still remains in the fjords around the strait. That fast ice has likely been in roughly the same place for years, so I'm not surprised that it's still fastened to the shores. There is no fast ice in the that area you need to go a bit further north to Hunt Fjord to find real fast ice, fast ice is a rare commodity in Greenland today and can only be found in very few places and Hunt Fjord is where you find almost all of it. Here is an example of fast ice in Kane Basin, attached to the Humboldt Glacier front. It has been subjected to above-zero temps for a long while, and the effects are showing - breakage, melt ponds, draining of ponds, more breakage. The high temps couldn't melt it all yet, though it's quite certain it will disappear by the time the melting season ends. The animation runs from May 16th to July 21st, skipping 3-5 days at a time except at crucial points or where clouds prevent it. Please forgive the very crude date labels. Oren , that is not fast ice it is ordinary sea ice. I thought that sea ice which is static by way of being attached to something is fast ice? ice that is anchored to the shore or ocean bottom, typically over shallow ocean shelves at continental margins; fast ice is defined by the fact that it does not move with the winds or currents. Any lake, river, or sea ice that is attached to the shore (including ice shelves), grounded in shallow water, or frozen to the bottom. Sea ice which forms and remains fast along the coast, where it is attached to the shore, to an ice wall, to an ice front, between shoals or grounded icebergs. Vertical fluctuations may be observed during changes of sea-level. Fast ice may be formed in situ from sea water or by freezing of pack ice of any age to the shore, and it may extend a few metres or several hundred kilometres from the coast. Fast ice may be more than one year old and may then be prefixed with the appropriate age category (old, second-year, or multi-year). Consolidated solid ice attached to the shore, to an ice wall or to an ice front. It forms by freezing to the shore of the ice cover forming in the coastal zone or as a result of freezing of drifting ice of any age category to the shore or fast ice. Vertical movement may be observed during tidal oscillations. It can be preserved without fracturing for two or more years transforming from first-year ice to multiyear ice and even shelf ice. The fast ice width can vary from several hundreds of meters to several hundreds of kilometers. That part of fast ice presenting a narrow fringe of ice directly attached to the coast with a shallow bottom and unresponsive to tidal oscillations that remains after the fast ice has moved away is called the Ice foot. Fast ice at the initial stage of formation consisting of nilas and young ice with a width up to 100-200 m is called young coastal ice. When coding and depicting fast ice on ice charts, total concentration is not indicated as this is always equal to 10/10 in accordance with the definition. Sea ice that forms and remains fast along the coast, where it is attached to the shore, to an ice wall, to an ice front, between shoals or grounded icebergs. Vertical fluctuations may be observed during changes of sea level. Fast ice may be formed on site from sea water or by freezing of pack ice of any age to the shore, and it may extend a few yards (meters) or several hundred miles (kilometers) from the coast. Fast ice may be more than one year old and may then be prefixed with appropriate age category (old, second- year, or multiyear). If it is thicker than about 7 ft (2 m) above sea level, it is called an ice shelf. Sea ice terminology, describing ice which forms and remains fast along the coast. It may be attached to the shore, to an ice wall, to an ice front, or between shoals or grounded icebergs. It can extend between a few metres to several hundred kilometres from the coast. It may be more than one year old, in which case it may be attached to the appropriate age category (old, second year or multi-year). If higher than 2 m above sea level, it is called an ice shelf. Sea ice which remains fast along the coast, where it is attached to the shore, to an ice wall, to an ice front, or over shoals, or between grounded icebergs. Fast ice may extend a few m or several hundred km from the shore. Fast ice may be more than one year old. When its surface level becomes higher than about 2 m above sea level, it is called an ice shelf. Most definitions here and elsewhere (internet search) declare that 'fast ice' occurs only on salty (ocean/sea) water. But this is not universal. Some definitions ignore the first couple of meters of ice against a shore (or the equivalent). I guess the ice stuck fast to my windscreen (windshield) on rare winter mornings isn't actually fast ice - but hey, wind and currents don't move it! Interesting to compare that to September last year - see Worldview 10th Sept 2016. It's clear that the fast sea ice breaking up in 2017 is only FYI. Also visible is the ice shelf, which is also "fast" but clearly is much older. I'm taken aback by the Oxford definition. I've always assumed that fast ice had some element of longevity inherent. Not necessarily the millennial + age of the ice shelves, but certainly not the ephemeral ice that melts away annually. Apparently a puddle that freezes solidly during a Sunday storm is fast ice, until melted away by a Monday zephyr. I'm liable to have difficulty adjusting to this definition. See additional definitions in my post above. None (alas) include "puddle ice", unless you consider Hudson Bay to be 'just a puddle'. In some languages we have many words for snow and ice, but in others we dont! Many word related to ice and snow originates from other languages than (Am) English. While I'll occasionally have it "On the Rocks", I'll usually drink my whiskey neat. 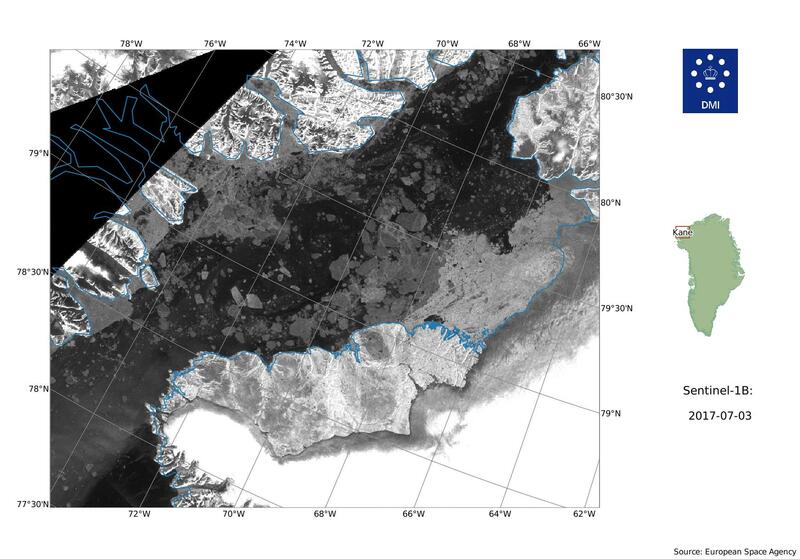 Seems to be good flow of ice through the Nares still looking at latest Modis images. Also the surface ice downstream of the Pietermann glacier has fractured and moved down the channel. Robeson Channel (northern Nares) and the southern Lincoln Sea ice flow between July 23 and 24 was northward! (DMI images) Easy to see is a floe off the mouth of Petermann Fjord. An interesting eddy appears to have formed southwest of the Petermann Fjord mouth. The Kane Basin appears to have kept the surviving part of the 'Bell Floe' (red marked) for the time being. 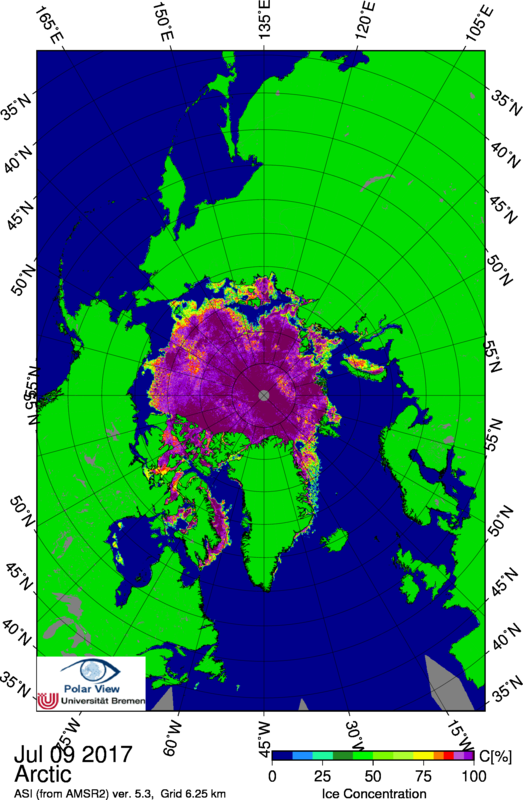 Someone remarked how ice is melting within Nares Strait. I believe them! This is from the 24th to me it suggests a surge of warm water coming out of the arctic at depth, into Petermann fjord, and there being forced to the surface melting and forcing out the seasonal fast ice. Further down the Baffin Sea, we've had southerly winds all month long. It's still continuing, as you can see by the ice motion reported by the Canadian Ice Service. That may be affecting export through Nares. edit: moved my reply to John to the Petermann thread. seems to be some sort of hold up, can it simply be the effect of the low to the north and the high in Baffin causing the current to flow north? Still fairly clear, if this was caused by northbound currents then by now some sort of equilibrium must have been reached. With the tides peaking tomorrow I'd expect to see the strait much busier this week. Looks like Nares is icing up, must be the windchill factor. Very cold water emerging from Lincoln could be cementing the ice there? I find it doubtful that open water in Nares is icing as the temperature on Hans Island in the middle of the strait is still a healthy 3oc. Wind chill cannot explain it either. The strait could be filling up due to increased export. The effect of wind chill is to increase the rate of heat loss and reduce any warmer objects to the ambient temperature more quickly. Dry air cannot, however, reduce the temperature of these objects below the ambient temperature, no matter how great the wind velocity. The bolded sounds wrong. Consider the chilling effect of dry wind on a damp surface due to phase change. ...cannot, however, reduce the temperature of these object below the Wet Bulb temperature, ... is I believe correct. Sublimation then? Do i believe what i see [albeit from afar] or what i know?
" Can a dry above-freezing wind blowing fast enough freeze water surfaces by evaporative cooling? " In the following i assume the air temperature and humidity can be fixed (infinite heat and humidity source and sink) and radiation is not important. so lets say you have a water surface that has a dry wind at 0.01 C blowing across it. Water will evaporate until the temperature of the water surface reaches 0.01 C. The next bit of water coming out will try to cool the surface below 0.01 C but it will remain 0.01 C because the air will dump heat in the water through surface conduction. lets say the air is at 0C. Then the water will give up heat thru evaporation till it reaches 0C, then give up more and freeze. then you will have an ice film at the surface. Ice has a lower vapor pressure than supercooled water, sublimation from ice is more difficult than evaporation from supercooled water below 0C. but the ice film at the surface will not cool more than 0C since the air above will keep it there. lets say the air temp is lowere to -0.01C. Then a sublimation will cool the ice to -0.01C but no more, since the air-ice interface will conduct heat out of the air to maintain temperature. A simpler way to think about the original quote might be to remember how wet bulb temperature was originally recorded. Two identical thermometers are tied together on a one meter long string. One thermometer's bulb is lightly wrapped in wet cotton, then the device is swung around ones head for ~30 seconds. The dry thermometer gives dry bulb temperature and the bulb wrapped with wet cotton provides wet bulb temperature. The delta between the two temperatures is lower the dryer the air is, therefor dry air blowing across a wet surface will lower the temperature to the wet bulb temperature, but no further. Thanks for the almost-OT but very enlightening discussion. Looking at the data on Hand Island, using 75% humidity and 987 mbars, a 3oc reading become 1.4oc wet-bulb temp. In addition, the wind speed is around 5 m/s so it's nothing dramatic. So perhaps Hans Island is not representative of the whole strait, but I don't think there is any surface freezing going on. The mystery remains what IS shown on the sat image. Thanks all, the sea emerges from Lincoln at about -1.2C, the air flows from high at about -20C, so presumably dry, more like -5C at sea level, and warms going north. Still at -1C over Lincon and i assume still quite dry, so freezing any melt water there, cementing the otherwise weak looking ice in place blocking export. So just a skin of ice disturbed by currents? At last there's some movement, too late to save my low guesses in the polls, but good we dodged the bullet.